There is a growing trend in North America towards making a personal computer small and powerful. Large cases are good for some applications, but sometimes it is more desirable to have the smallest possible formfactor you can manage without the expense of a laptop. To this end several companies have produced small formfactor Cube computers. These computers, like Shuttle's SS50 use special motherboards and standard components to maximize features and lesson space requirements. Things which are normally the product of an expansion card or two are integrated into the motherboard and the result is something that if tuned right can be extremely quiet. One look at the SS50 and I really don't have to say much more to convince you of its many applications and coolness factor. Great for LAN parties, MP3 servers, or just something cool for the receptionists desk is something you can decide. 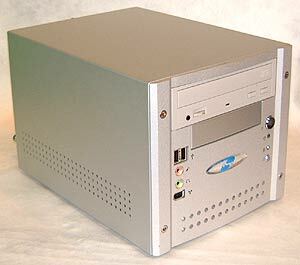 What is very new about the SS50 is that it is a socket 478 Pentium 4 DDR based computer. There are expansion slots for AGP cards, but video comes rather from the SIS 650 chipset. With two DIMM slots capable of supporting up to 2GB of PC2100 DDR, onboard 10/100 NIC, Firewire, 6-channel AC'97 audio and TV-out capabilities there isn't a whole lot this small aluminum cube couldn't be tasked to. The all-aluminum Shuttle SS50 chassis comes with the motherboard, power supply, and heatsink. Add the rest of the components you'll need for your own DIY Cube computer and get ready to have some fun with this little box. The unit comes with just the motherboard, powersupply, case and a Thermal Integration heatsink, but strap in a 16XDVD player and output the signal to a TV and you could be up and watching movies in short order. Looking at the SS50 from the outside a few things strike you. First and foremost is size, the little aluminum box is very small measuring just about 7" x 8" or barely larger than a toaster. The matt aluminum exterior is gorgeous and bridges the gap between a computer and a piece of fine electronics. The front of the SS50 is full of somewhat more mixed impressions. While I applaud the extruded aluminum front bezel, some of the details (read; port) take away from the overall appeal. The vent holes in the extruded aluminum bezel are only skin deep and do not actually go through to the inside of the enclosure. The hex screws are nice, but the medial ports show too much of the actual surface mount component. A little more attention to detail right here would have done wonders for the mystique of the SS50, but regardless of this, it still looks better than a beige box. The rear of the little Shuttle SS50 is predominantly filled up with the 80mm exhaust fan and large assortment of ports. Unlike a typical computer system, much of what you need is pre built onto the motherboard, including the video card which is based from the SiS 650 chipset. A small exhaust fan from the power supply compliments the larger case cooler, and aside from the two PCI expansion slots there are the following jacks: (2) comm ports, 15-pin VGA, PS/2 keyboard & mouse, (3) mini audio jacks, (2) USB1.1 jacks, (2) firewire IEEE 1394 jacks, an RJ45 10/100 Ethernet port and an SVideo TV-out. Incidently on the front of the SS50 are two USB ports, an mic and headphone audio jack and one IEEE 1394 jack.